Found A Place For That Pesky Paper Towel Roll!! We have chased our rolls of PTs around the Casita kitchen for 6 months now and we finally figured out a spot to put a holder. We made it from 2 Command strips and a short loop of white nylon line..tied securely with a stout "Scout knot"(lol) and installed it ON the front of the flip-UP door wh is above our microwave cabinet. It is a smallish cabinet we do not use frequently and the towel roll flips UP so that it allows the cabinet door to open well enuf to get to stuff stored inside. No glue, no drilling and no tape! ;-) Still easy peasy to get to the MW in its cabinet below..
Edited by Fred&Holly, 06 September 2018 - 06:56 PM. I really don't know why they installed it where they did, but when I bought my trailer, they had mounted it inside the cabinet above the sink/stove. Not at all handy, and what a waste of space! I moved it outside and mounted it on the rear right overhead compartment door. It's not over or near the stove, but handy to grab from when I need to. Edited by Euphoria, 07 September 2018 - 06:41 AM. "If I have seen a little further, it is by standing on the shoulders of giants." Not only was the original positioning of the paper towel inconvenient and space wasting, but the holder itself was cheapo junk that couldn't hold a full roll. Now I use a pedestal type of holder, holds the towel upright and we put it on the table. Sometimes I think the folks at the factory don't actually USE the things they put in the campers. Or think it out...where would X be best positioned? I think they just..well, stick it. I went with a heavy duty magnetic mount. I can squish the ends together to keep it from unrolling on the road. While camping I spread them apart a bit for easier use. From what I see in your pic, it looks like it's a little too close to the stove for my likes. Edited by Euphoria, 07 September 2018 - 02:14 PM. I have the metal stove cover that swings up and locks in place, so the paper towels are out of the way. Good thought though. Yup..we put the PTH far away from water and stove but still close enuf to grab..LOL but where isn't in a Cassy "wink"
We also use the heavy duty magnets on the stove hood. We don't really use the stove so proximity to it isn't an issue. I have a vertical stand for the roll I use outdoors when I cook. I like the command hook idea, though -very resourceful! Fred, what is the rope with the square knot on the closet door used for? (the one shown in the background of your pictures). Actually it is the rope we S-hook to the cassy main door, [when it's open] and we have the awning up...That keeps the wind from slamming the door shut. or banging it forcefully into the front awning post ..IF it is hooked to the side of the trailer.. The white line we used in the paper towel thing is smaller nylon line. ;-) We use that softer biggerline so it does not scratch the finish on the awning support etc..
Edited by Fred&Holly, 08 September 2018 - 10:40 AM. But before you're allowed to learn to use the M88, you learn how to yank a vehicle out of the muck by hand..using block and tackle, ropes , knots, and good ol' leverage. It's amazing how much weight you can pull by hand as long as you've got the rigging right and enough blocks. And that means knots, a good rope, and good blocks. What is it Archimedes said? "Give me a fulcrum and I shall move the world." Edited by Meadowlark, 08 September 2018 - 02:06 PM. I dont see how the paper towels are vulnerable even if I use the stove. well, Zimm, maybe the roll will catch fire if you use the burners to roast marshmallows over, otherwise, it looks safe enough for me. Where Casita put ours was only a few inches higher, in the cupboard over the stove vent. 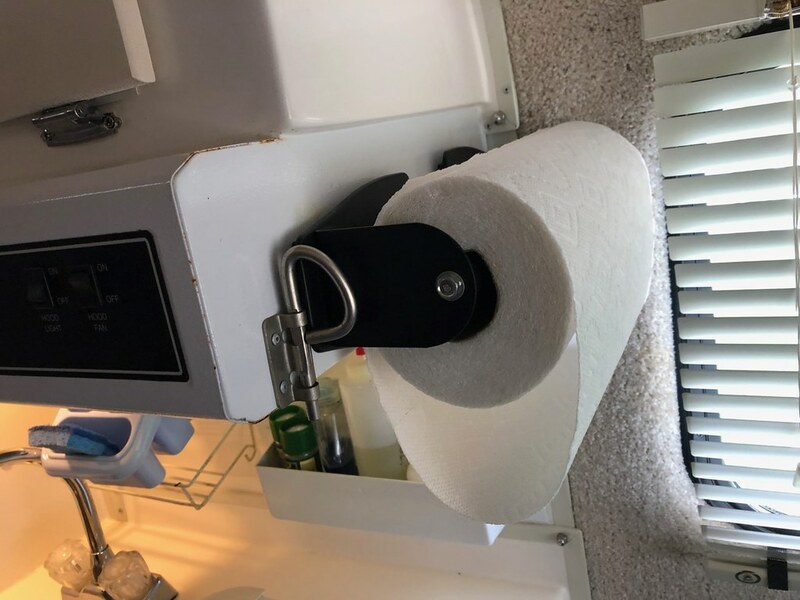 I am ASSUMING (yes, I know the danger of that) that Casita did the safety testing before placing the roll holder where they did but...............nahhhhhhhhhh, probably they didn't. Where did you get that nifty magnetic mount? I think my bug repellant will blow up before the paper towels go. Edited by Zimm, 08 September 2018 - 03:34 PM.